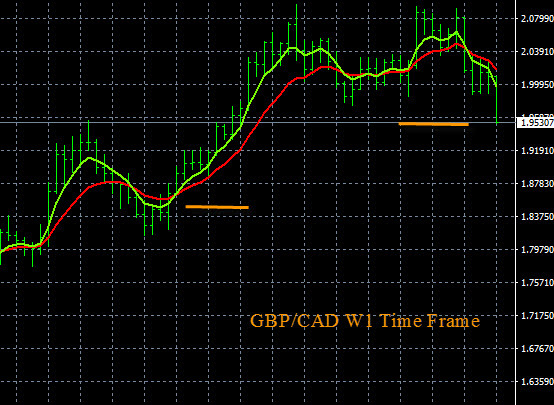 The GBP/CAD trend analysis is shown below. This pair is trending down on the W1 time frame. It has a current support level and price alert point at 1.9515. Traders can set a price alert there. After the alert hits look for a verification sell signal on The Forex Heatmap®. We see no nearby support below there and substantial pip potential down to the 1.8550 area, or possibly lower. Both the alert price and next major support area are noted on the trend analysis chart below. This analysis demonstrates how we prepare our daily forex trading plans for 28 currency pairs. We trade with the major trends of the forex market. 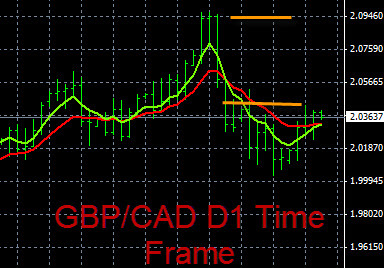 The GBP/CAD analysis below shows that this pair has broken through short term resistance and is now trending up again on the largest time frames. The current short term resistance level is at 1.8730. We would set a price alert here. When the alert hits we would look for more buy signals going forward above this price on The Forex Heatmap®. The upside potential on this trend is still very good. The Canadian Dollar (CAD) interest rate news today could signal more CAD weakness ahead, which would continue to drive this pair higher. 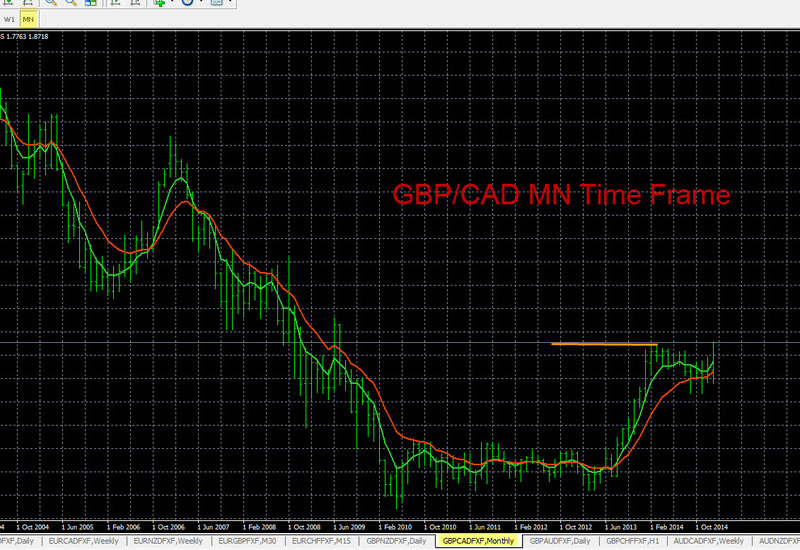 The analysis of the GBP/CAD was performed with multiple time frame analysis. 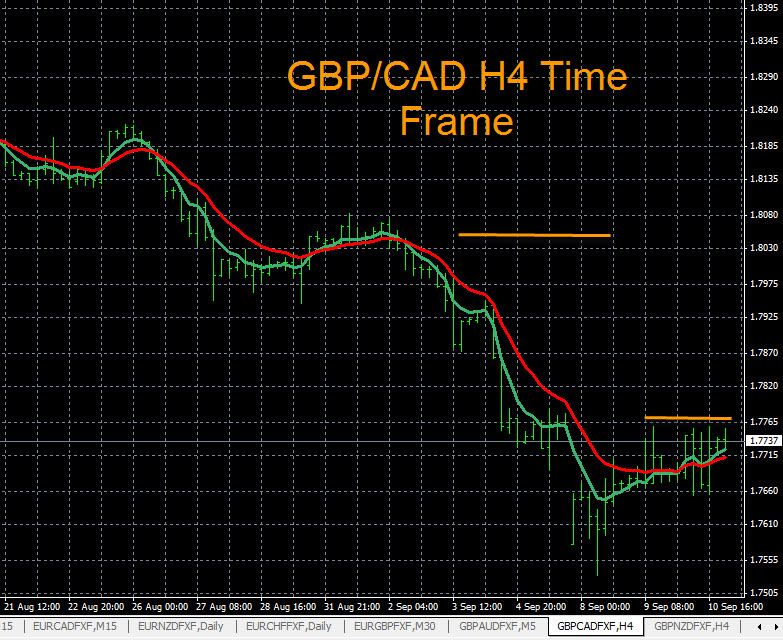 The GBP/CAD H4 time frame is shown on the chart below. This pair could reverse back up in the main session tomorrow on this time frame as well as the D1 time frame. Check the news calendar for the British Pound (GBP) news drivers tomorrow. Current resistance and price alarm point is 1.7780, shown by the yellow line. Set a buy alert here and when the alert hits check The Forex Heatmap® for a buy signal. The target resistance area is 1.8050. The majority of the exotic pairs on the market have been retracing against their major trends, so this up cycle would be expected to be 2-3 days, similar to the recent retracements and up cycles on the GBP/AUD and GBP/NZD. This happens frequently when pairs on the same currency group follow each other like dominoes falling. The H4 time frame on the chart below is exponential moving averages set up on meta trader. 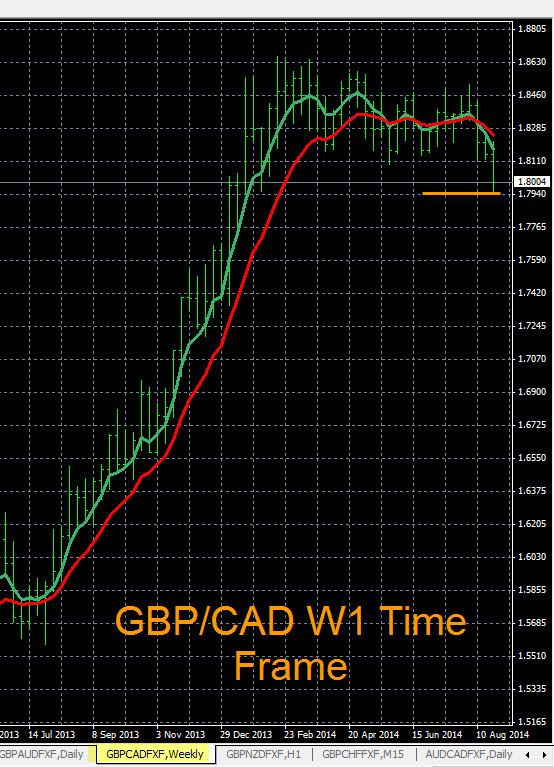 The GBP/CAD trend chart indicates that this pair is trending down on the larger time frames, like the W1 time frame shown below. This pair has hundreds of pips of potential and we would start looking for sell signals going forward. The current support level is just below 1.8000. You can set a price alert here, and when the alert goes off verify your sell entry with The Forex Heatmap®. The British Pound (GBP) pairs are currently trending on many of the pairs we follow. The chart analysis you see below is performed with multiple time frame analysis by individual currency. Today in forex trading, The Forex Heatmap® gave trade alerts for consistent GBP strength. 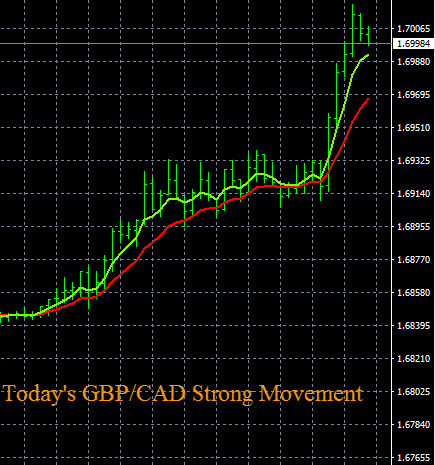 The GBP/CAD moved higher as the British Pound (GBP) strengthened across the board. The EUR/GBP also moved lover, and this pair is trending lower on the higher time frames. The GBP/NZD is cycling up on the H4 time frame and should continue up to the 1.9650 area resistance area. The alert system you see below is The Forex Heatmap®, which provides live visual trade alerts for 28 pairs and eight major currencies.